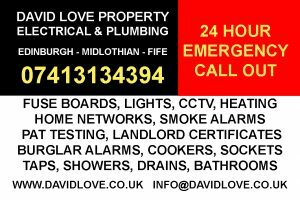 David Love Property is an emerging company that offers quality plumbing and electrical services in Edinburgh, Dalkeith and Midlothian. Our expert on call plumber offers 24-hour emergency cover 7 days per week. From sanitary fixtures to connecting rainwater tanks for flushing toilets, we have the entire resources and expertise to address all the emergency plumbing needs of our clients. During an emergency situation, people can call out a professional plumber from David Love Property. Our professional team of plumbers will be happy to undertake any plumbing or electrician job that you may need to be done in your commercial or residential premises. Our services are accessible in any part of the Lothians let that be Edinburgh, Dalkeith or Bonnyrigg. Owners and renters often find them in a position where they need to acquire professional services to address their plumbing needs. Especially when it comes to a serious leak, the urge of getting professional services increases even more. From gas leak to a broken pipe, in this type of emergency situation, a professional plumber from David Love Property can be at the clients site within an hour. Here, it is important for owners to understand that they cannot take their plumbing needs, as well as the safety of the residents for granted. There are lots of plumbing situations you will face during your lifetime that are beyond the amateur expertise of your friends or family members. In a situation like this, it is always suggested to call out a professional plumber from David Love Property because we offer 24-hour emergency services. It really does not matter whether you are from Edinburgh, Dalkeith or Midlothian, if there’s plumbing need then David Love Property will be there for you to address your need. What Makes Us the Best Service Provider in Edinburgh, Dalkeith& Midlothian? From sewer backups to fixing a frozen pipe, you will get our helping hand in Edinburgh and the Lothians. From minor repairs to emergency leaks, our professional on call plumber takes every job with great care. Our expertise and experience enable us to address any need of our client within the minimum time period. Our family-owned business launched in 2001. Since this successful journey of around 17 years, we have addressed the plumbing needs of thousands of customers and brought comfort to their daily life. If you find yourself with a plumbing issue, then feel free to call us on. We offer fixed price quotations. So, next time you find yourself in any plumbing need, you know 07413134394 is the number to call out for professional plumber from David Love Property.